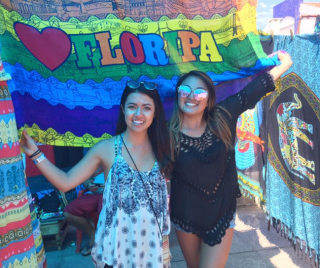 Business student Taryn Umeda gives her perspective on her trip to Brazil through BUS 304 Establishing International Supply Chains. 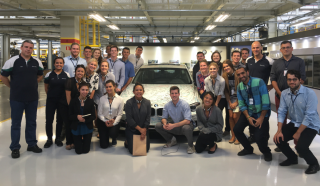 This past winter quarter, the Orfalea College of Business offered a Business in Brazil program for students from all majors to take a course on Establishing International Supply Chains. 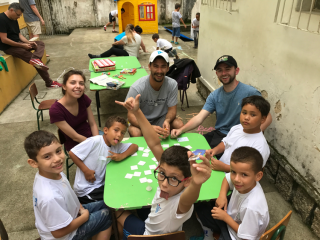 After finishing the course, my class of 26 students met up in the heart of Florianopolis, Brazil to begin an educational and memorable trip of a lifetime. Our trip encompassed a unique mix of four company tours: BMW’s car manufacturing site, Intelbras’ telecommunication company, Uatt’s gift retailing warehouse, and in addition to manufacturing sites, we got to head down to the shipping port along the coast to learn about the Pilotage and Marine industry and how that factors into global logistics. In the end, we left Brazil with a greater understanding of the flow of global supply chains and the Brazilian culture that surrounds it. Each company welcomed our class with an introduction and an insight to their supply chain. We learned about the logistics of how and where each company procured their raw materials from foreign sources. We got to walk-through the floor of the manufacturing sites and see how they assembled their products. Then, the companies would explain their warehousing strategies and the movement of the products to the final customers. Each company was open to sharing their Key Performance Indicators as well as what strategies they utilize to mitigate risks within their supply chain. Throughout each company tour, we were interacting and asking questions to company executives and managers to get a gain a better idea of how all the functions work together. These tours allowed us to see the real-time movement of products, services, and information, and ultimately allowed us to analyze and compare each company’s unique production style. Personally, my favorite visit was the BMW car manufacturing site. This BMW site started up in 2012 with intentions of producing for the Brazilian market, however, the manufacturing site now produces for the United States market as well. They currently produce X1 SUV models, X3 series, and 3-series vehicles. The BMW company places a high priority on quality, making sure that every vehicle is consistently tested throughout the assembly process, therefore, ensuring that each car meets their top-notch standards. Due to the fact that they are a fairly new company, they are still tackling challenges within their supply chain to keep procurement costs low, increase production, and adjust to their new market. However, they are expecting great improvements within the next couple of years. Overall, we had an amazing time traveling around Florianopolis, Brazil. 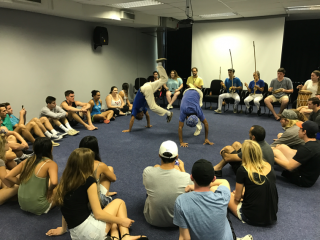 From the sand boarding on the dunes, to hopping to all the beautiful beaches, and learning an authentic Brazilian-style dance, and finally hiking to secluded spots on the island, we were able enjoy all the amazing spots that Florianopolis had to offer. I cannot express how thankful I am for the experiences I had, the people I travelled with, and most importantly, how thankful I am for Professor Deif, Professor Javier, and our tour guide Rodrigo, for organizing this trip of a lifetime.